I am happy to report that I have completed the art quilt I started during a class I took starting in January this year at Patricias’ Fabric House. You can read about how it all started by scrolling down towards the bottom of this post. The class taught us how to piece a design using freezer paper. The design used for the class was created by Pat Pauly using a technique developed by Ruth McDowell. I had finished piecing the four 2′ x 2′ blocks of the same leaf design and pieced them into a large 4′ x 4′ quilt top by mid February, but since I hadn’t been quilting for very long I wanted to wait until I had more experience before actually quilting it. A few weeks ago I finally basted the quilt top. I used 505 spray baste and would highly recommend it. 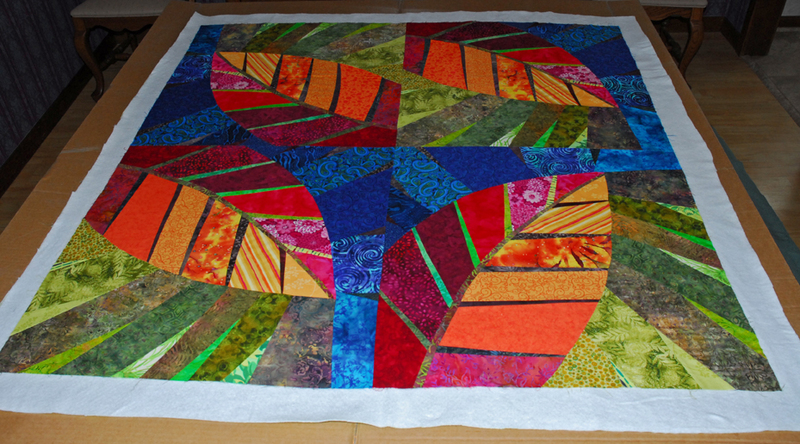 It is nice to be able to quilt without having to stop and remove safety pins every few inches. If you do a careful job of securing the backing to your work surface so it is smoothly stretched out, carefully apply each layer (batting and then quilt top), and smooth each layer out as you go you should have no problem with shifting layers while you quilt. 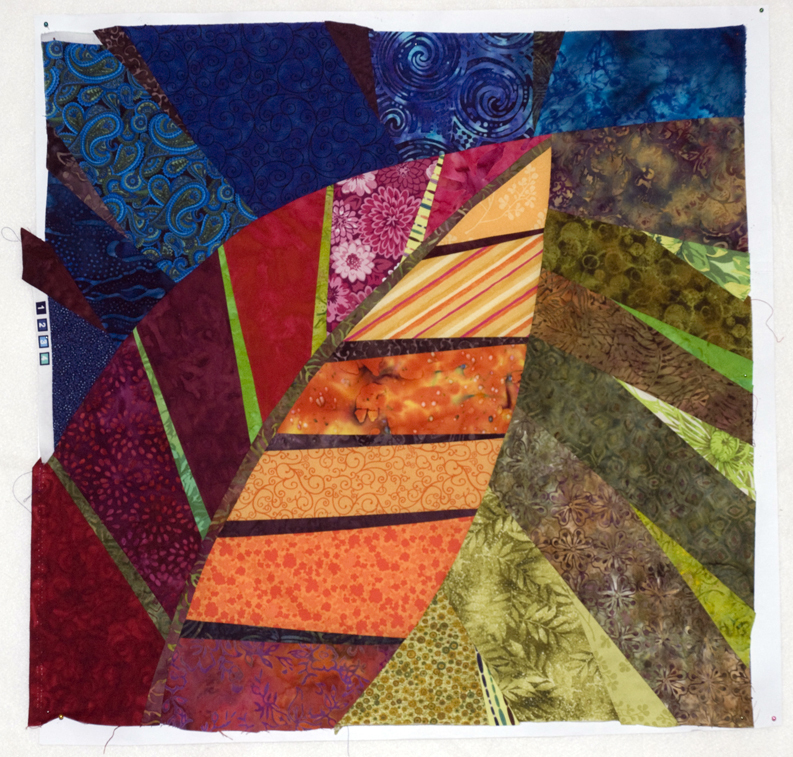 Since this piece is an art quilt I didn’t want to just do an overall quilting on it. 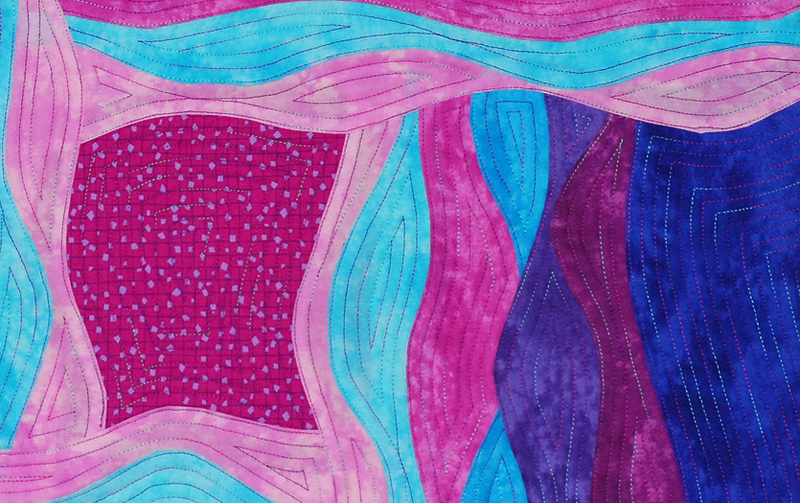 I used four different colors of variegated thread and quilted a different pattern in the different colors. 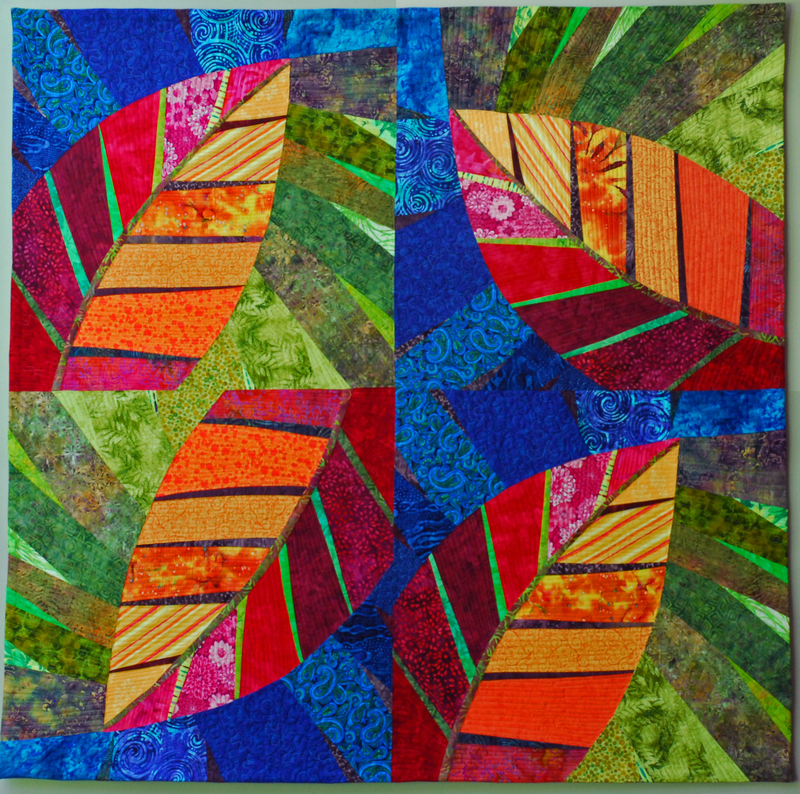 In the red and orange areas I quilted in long skinny rectangles going the length of each section of the leaf part of the design while leaving the “veins” of the leaves unquilted. In the green area I wanted the quilting to represent grass so I quilted that area in long skinny triangles. The blue is done with stipple quilting. 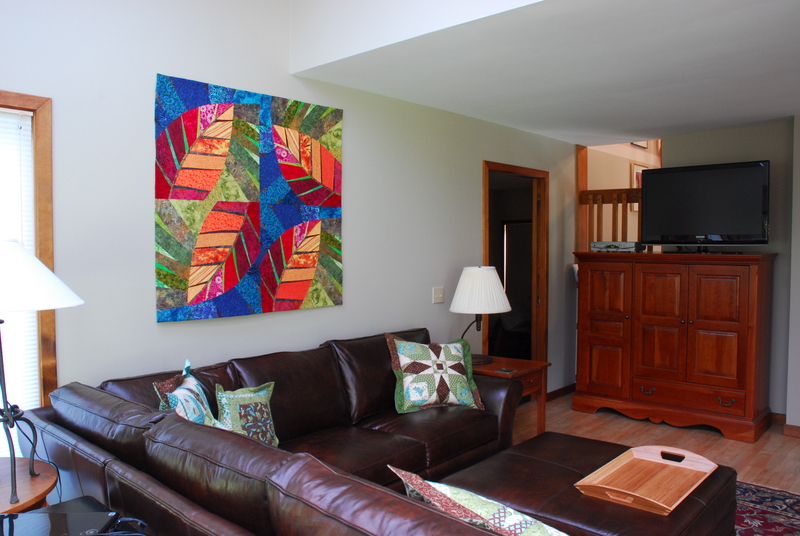 Not a very complicated design overall, but since the plan was to hang the finished quilt in our family room the quilting needed to be well done. A few months ago I ordered some YLI machine quilting thread (40wt.) in the varieties of colors I wanted for this quilt and I planned on using a solid green thread for the back of the quilt since the back is just green with a vine design on it. Before starting I prepared my machine by cleaning it and putting in a fresh needle. I set up my Free Motion Assistant and got started. This is where the frustration and growling from me began. I didn’t realize that I was growling my frustration until my husband mentioned it after I had completed the quilt (he also asked if this really was a relaxing hobby 😛 ). I could not get the tension set so that you didn’t see the top thread coming through the back and even with the tension set to zero the top thread was still shredding. I did some research online to see if I could find some advice and picked up a few hints to try. A quick trip to Joann’s the next day for some different needles and I was back at it…or so I thought. One of the recommendations was to use “sharp” needles. I remember one quote I read saying something like, “using a universal needle to quilt is like trying to push a baseball bat through the surface of your quilt.” Within a couple of stitches of using both a size 80 and 90 sharp needle I had two broken needles, and more growling from me! The next thing I tried was a topstitch needle. That work a little bit better, but the thread was still shredding every so often. When I was at Joann’s I also found some small spools of Coats & Clarks variegated thread in colors that were close to the ones I was trying to use. The thread was a smaller weight than the YLI thread and I also decided to use the same thread for the bobbin to simplify the variables a bit. With the tension set to almost zero I was finally able to get the stitches to look the way I wanted them to on the top and the back. Some quilters do not think the Coats & Clark brand of thread is very high quality, but so far it has been my go to thread for free-motion quilting. From there it was smooth sailing! Finally! The Free Motion Assistant is a pleasure to use once you get the thread tension set up. I was able to finish the quilting in a few short evenings after work. The most difficult part was quilting in the blue area since it is a dark fabric and I was using mostly dark thread I couldn’t always see where I had already quilted. Overall I didn’t quilt over my stitching more than a couple of places in that area and it is very difficult to find on the quilt top so I left them be. I could now tell my husband that quilting was a relaxing hobby when it all goes well 🙂 . To finish the quilt I decided to use the facing technique that I used on my Wind and Waves quilt because I didn’t want to add even a small border around the edge by adding a binding. I just love the way it makes the quilt look like a painting on canvas when hanging on the wall. After blocking the quilt we put it up in our family room over our new sectional. I am thrilled with the final product and how it looks on display. If I do say so myself, I think it is a stunning piece! I plan on showing it in the August show put on by Patricia’s Fabric House so if you are in the area stop by if you want to see it up close and personal. 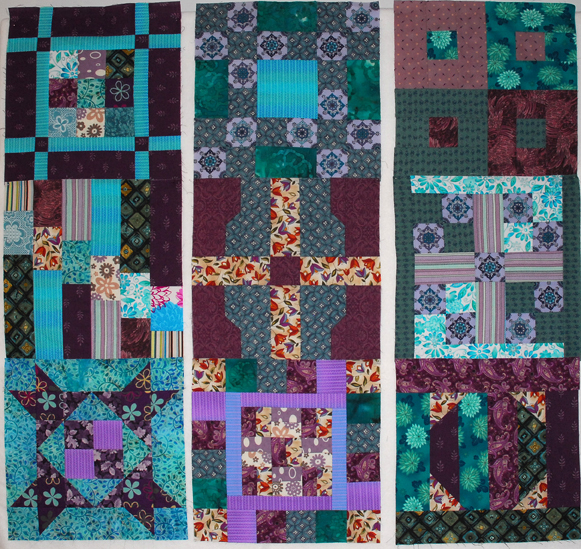 I have now completed 9 of the 12 jelly roll blocks and am up to date with the quilt along so I thought I would catch up on showing them to the blog world (all two of you who are reading this 🙂 ). Block seven is my favorite so far. 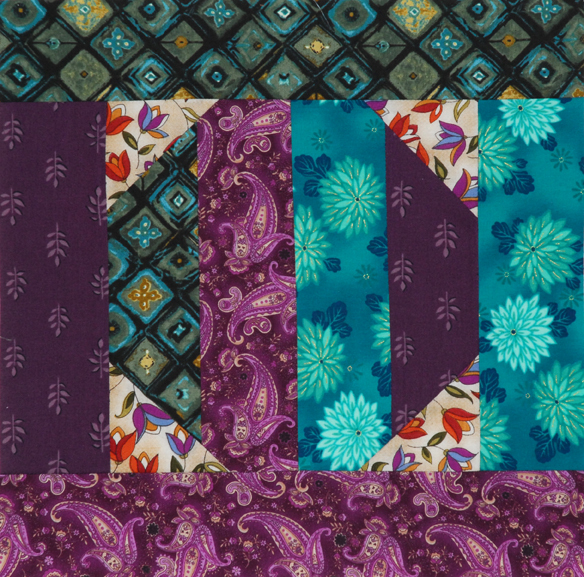 I love the batik that I used for the majority of it and overall I really like the pattern of the block. Block 8 required some intricate work to piece the small blocks together and at first I had some difficulty sewing the strips on in the “around the world” style. For this block you had to do it twice. Once for the solid strips that surround the center 9 block and then for the rows of blocks that surround the block. The second time around I finally understood the technique and it was much easier to do. For block 9 I tried to use some of the fabrics that I haven’t used much of so far. This was at the request of my Chief Creative Consultant (CCC – husband Charlie). He had a couple of favorite fabrics in the stash that he wanted me to use more of so I obliged him. At first blush the pattern would appear overly simple, but I love the way this one turned out and I like the larger strips of fabric used so it shows off the fabric a bit more. 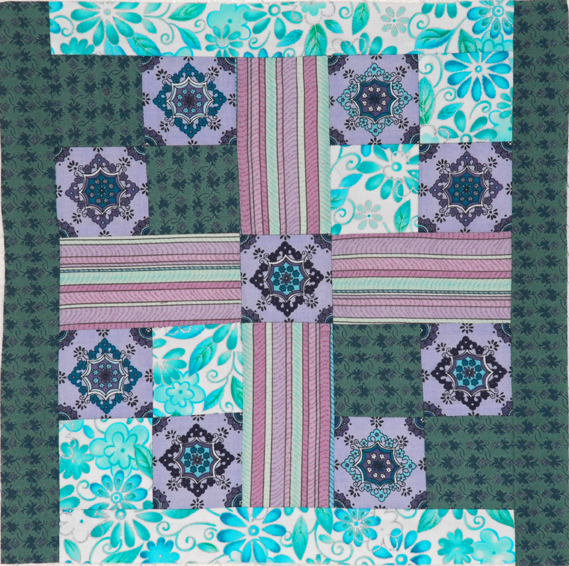 With all the blocks pinned up on my design board, it was obvious that the original block 6 I had created just didn’t fit with the others (see the original here by scrolling down the page a bit). I was aware of the incongruity that this block created, but didn’t feel like attempting a new one at this time. My CCC emphasized to me just how disturbed he was with the mismatch that this block created among the set so after careful consultation I decided to keep parts of it and remake the block with some additional new fabric. After a complete rip out I am very pleased (as is the CCC) with the final product and it works very well with the set. 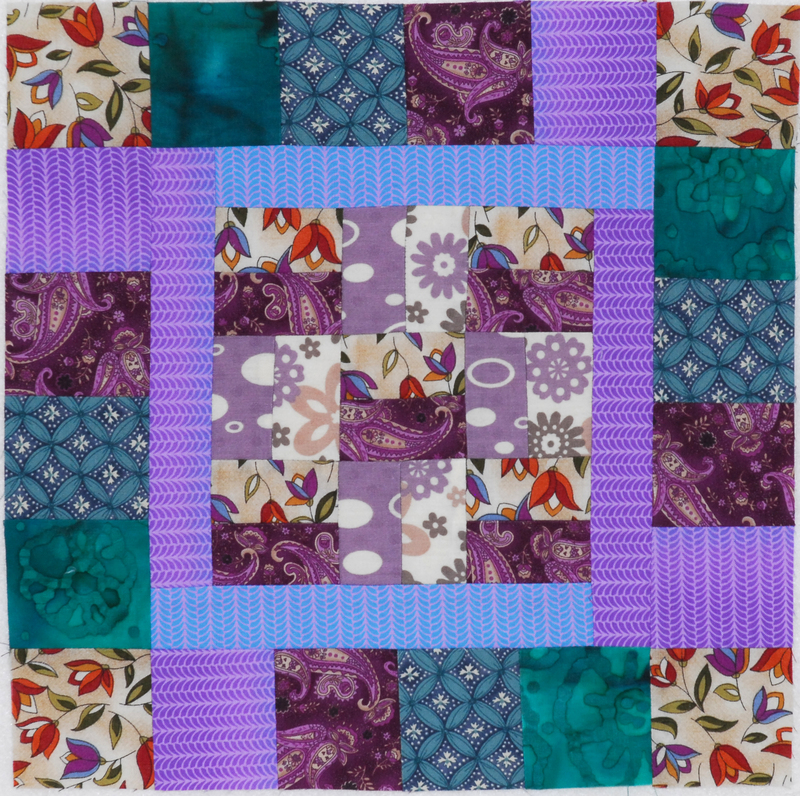 These are the first 9 blocks created for the jelly roll quilt along. They are in order left to right and top to bottom as they were created and not necessarily in the order they will be layed out in the finished quilt. I am loving the way it is coming together. 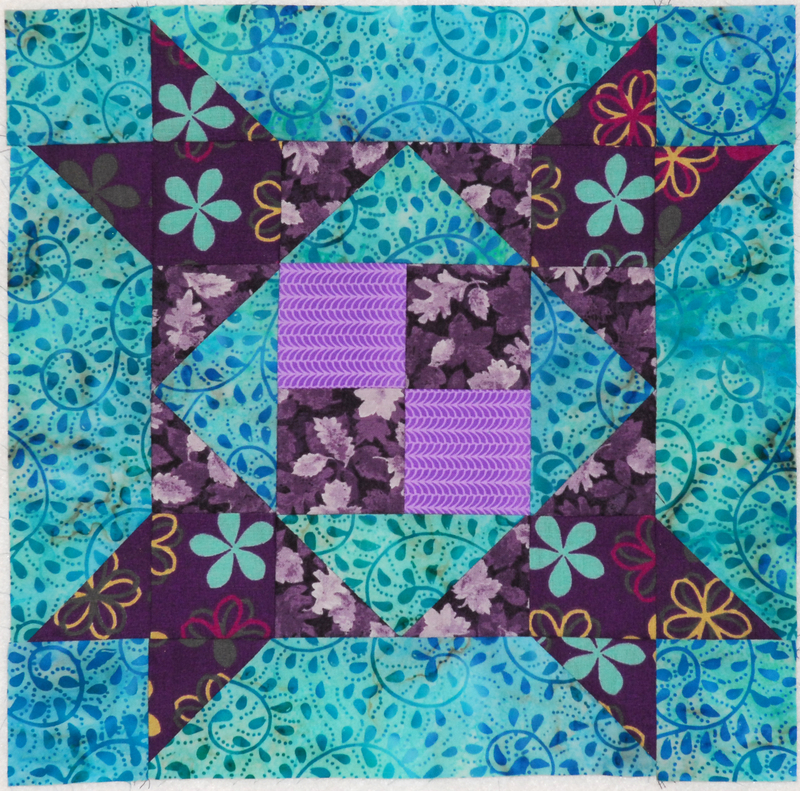 The next pattern comes out on July 5th and the CCC has already given me a set of fabrics to use for this block. I do love that he has taken an active interest in helping me create the best quilt I can. Each time a new pattern comes out and the block is finished the participants upload a picture of their finished block to a flickr group for all to see. This also enters you in a drawing for a variety of prizes. 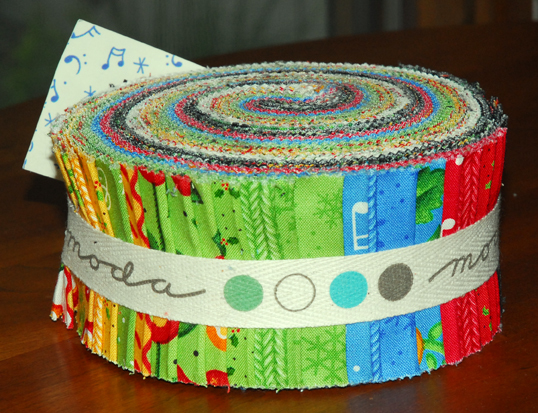 Well, at the last drawing I WON A JELLY ROLL!!!!! I don’t mean to shout really, but I almost jumped out of my skin when I was looking at the announcement post and saw MY BLOCK as one of the winners (just scroll down a bit on the announcement page to see it – my username is harrispen). 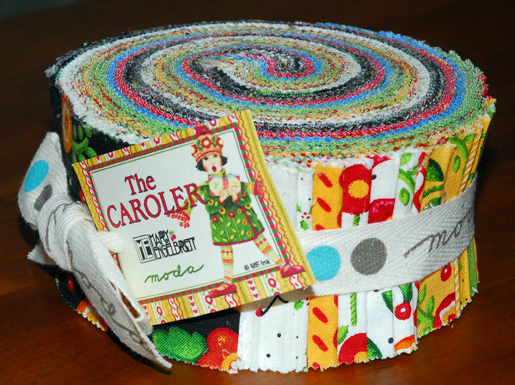 Thanks so much to Konda at Moose on the Porch Quilts for hosting this fun quilt along and for the great Mary Engelbreit jelly roll in the Caroler pattern she sent me as my prize. My CCC and I are already contemplating how best to utilize this cute set of fabrics for a holiday themed quilt. I’ve wanted to post about some of the projects I have worked on that are complete for quite a while, so here goes! First up is the Easy Waves Piecing wall hanging I did for a class I took at Sew Creative in Fairport, NY. The class was taught by Pat Berardi a member of both the Genesee Valley Quilt Club and Perinton Quilt Guild (among others) that I too am a member of. 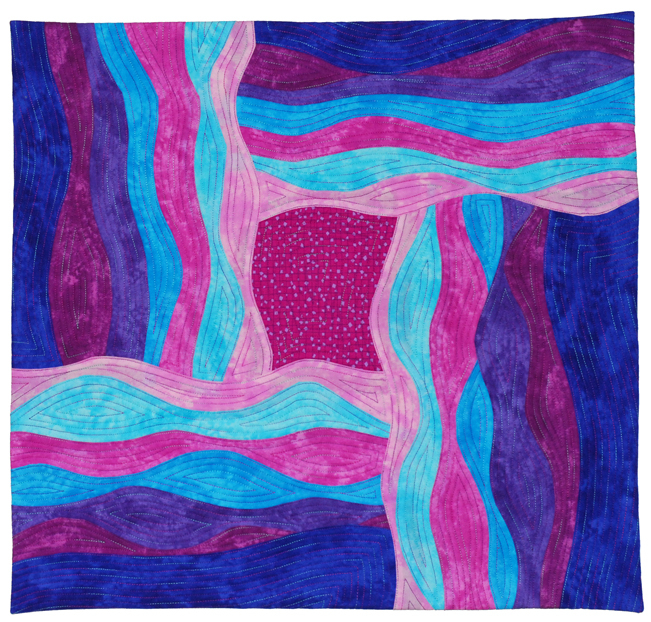 The purpose of the class is to help you stretch your artistic quilting skills a bit by using the techniques described in Karen Eckmeier’s book “Layered Waves,” with one small adaptation Pat developed to make things even easier. As with all the classes I have taken so far, this was a fun group to work with. Pat did a great job of demonstrating the technique and offered guidance in picking out fabrics and arranging them for the finished product. I hadn’t put too much thought into what fabrics to use for this project since it was for a class. My thinking is to emphasize learning the technique and not to worry too much about making the perfect finished product. I picked out colors I liked that went well together. A couple of fat quarter packs that blended well together fit the bill. If I were to do it again I probably would have added some patterned fabrics to the composition. The quilt doesn’t fit in with my home décor so currently I have the quilt hanging in my office at work and have received many compliments on it. A couple of people thought it was a painting at first until I pointed out that it was made of cloth. As an added bonus Pat also showed us a technique for finishing the quilt using a facing technique instead of the typical binding. I love how the piece turned out with a “borderless” finish and plan to use this technique on future wall hangings. I don’t have a picture of that because the facing blends so well with the backing you can’t see it. The other project I worked on recently were the pillows for the sectional we ordered back in early March. The sectional finally arrived on June 25th and I finished the last two pillows that night. I completed the large pillows a few weeks ago and was very happy with how they turned out. In late March I purchased a fat quarter bundle of Cherish Nature fabric designed by Deb Strain for Moda before I knew what I was going to do with it. Who does that? 🙂 Shortly after I got the bundle I knew I would use the fabric for pillows and other things to accessorize the sectional with. The color pallet is perfect to go with the dark brown leather of the sectional and the theme fits well with our home. 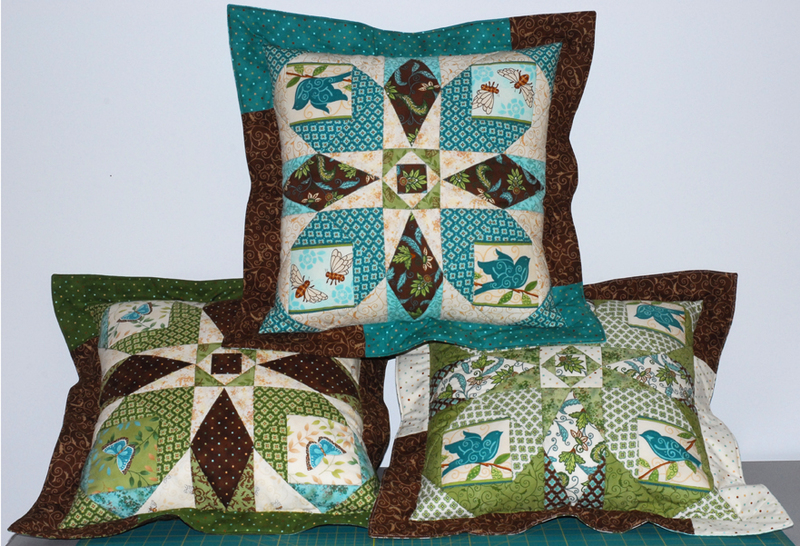 When I first received the fat quarter bundle I didn’t know what I would do with the three panels that came with it, but after discussion with my Chief Creative Consultant (CCC – my husband Charlie) I decided to use parts of the panels for the back of the pillows. I had three panels and 6 pillows to make and each panel contained one large and one small square that could be cut out to use for the backing. I added some borders and put a zipper in each one so I can change them up or wash them in the future. The way the panel squares worked out they made a great place to hide the zippers. I think they all look great on the new sectional and are also very comfortable and functional. You can check out pictures of all the pillows on my flickr page. The pillows look great on the sectional! 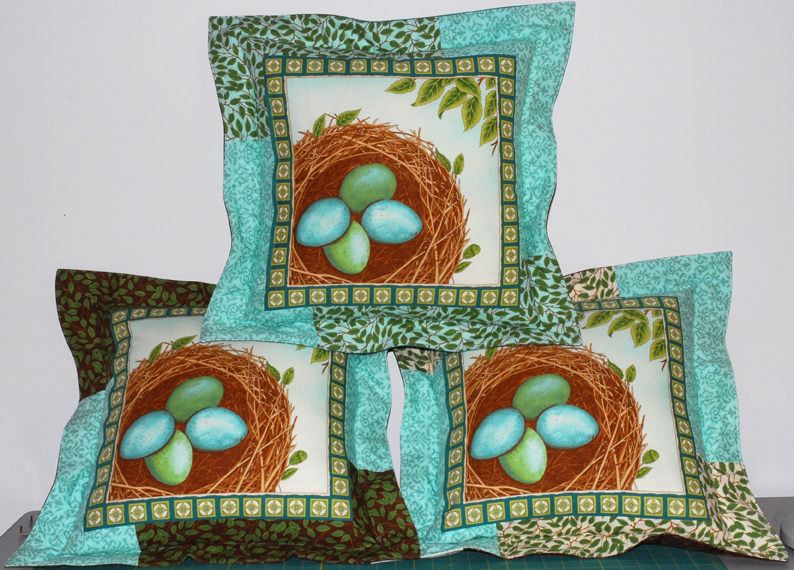 Next up is to put together a throw and wall hanging using the Cherish Nature fabric.